I've been loving Valve's mini-game Portal this last week or so. Everyone's been getting Orange Box, but I've only been able to get my hands on a copy of Portal. Not that I'm disappointed. It's a great little game. And the ending song is brilliant. Anyways, I've got a few more things to throw up onto the internet now. 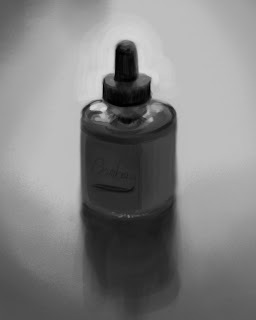 I've decided to start doing grayscale speedpaints of whatever I find around me in hopes that my painting and tonal skills will improve. I might even move to color once I feel comfortable enough with my grays. I've got two so far, and I hope that I'll have more to come soonish. 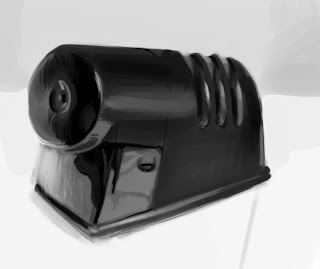 Yesterday's was my heavy-duty Xacto pencil sharpener from the lab. Today's was a bottle of green Dr. P.H. Martin's India ink. And lastly is a pic that Robin found. 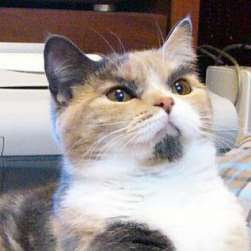 It's me as a cat. Seriously. That's all I've got for now. I should have more speedpaints, a painting assignment, and maybe some character designs up in the next week or two.